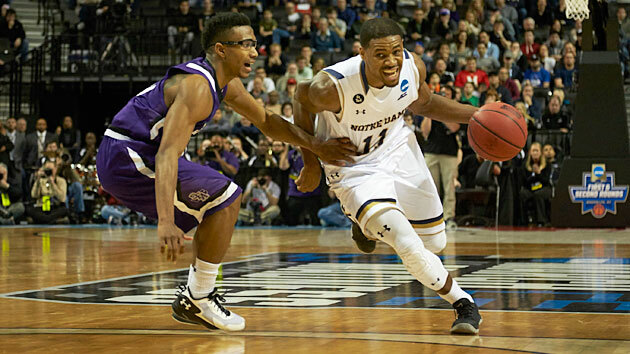 Everything you need to know about the Notre Dame Fighting Irish as they begin the Sweet 16. The Case For: Notre Dame entered the NCAA tournament having hit a rut offensively, scoring below 0.90 points per possession in three of its final five games—including a woeful 0.68 PPP output in a loss to No. 1 seed North Carolina in the ACC tournament semifinals. Whatever Fighting Irish coach Mike Brey did in the week between that defeat to the Tar Heels and Notre Dame’s tourney opener against No. 11 seed Michigan, it clearly worked. The Irish rung up 1.15 PPP and 1.27 PPP on the Wolverines and No. 14 seed Stephen F. Austin in the first and second rounds, respectively, to set up Friday’s game against No. 7 seed Wisconsin. Michigan is far from a great defensive team (107th nationally in adjusted points allowed per possession), but Notre Dame’s showing against a Lumberjacks squad that leads the nation in turnover creation was impressive. Jackson scored 18 points as part of one of his best performances of the season, while senior center Zach Auguste finished efficiently on the interior and pulled down a game-high 15 rebounds while shooting 8-of-9 from the field. When this team gets going, it’s really tough to contain. The Irish feature one of the best players left in the tournament (Jackson), a strong inside presence (Auguste) and dangerous perimeter shooters (juniors V.J. Beachem and Steve Vasturia). The Case Against: For as potent as Notre Dame is offensively, it’s really vulnerable on the other end of the floor. The Irish rank near the bottom of Division I in forcing turnovers (only 14.6% of opponents’ possessions), they allow too many second-chance opportunities (263rd nationally in opponents’ offensive rebounding percentage) and they don’t excel at either forcing missed shots inside the three-point arc or protecting the rim. All told, Notre Dame checks in at 174th in the country in adjusted points allowed per possession, by far the worst mark of any team left in the NCAAs. Given the Irish’s shoddy coverage, they likely will need to continue to score at a clip on par with or above the 1.19 points per possession they averaged this season. Jackson, who carved up a stingy Stephen F. Austin team on Sunday, can help them do that—no opponent will be able to shut him down for 40 minutes—and Notre Dame also got timely contributions from other players during its first two games in the tournament. Still, there will be a game, perhaps as soon as Friday, when the Irish will simply need to lock in and get a few key stops. There’s little evidence suggesting they can do that.